Marshmallow PEEPS are one of my favorite Easter treats so when I saw the printable PEEPS party package from Princess & The Peas, I knew I wanted to put a little party together! 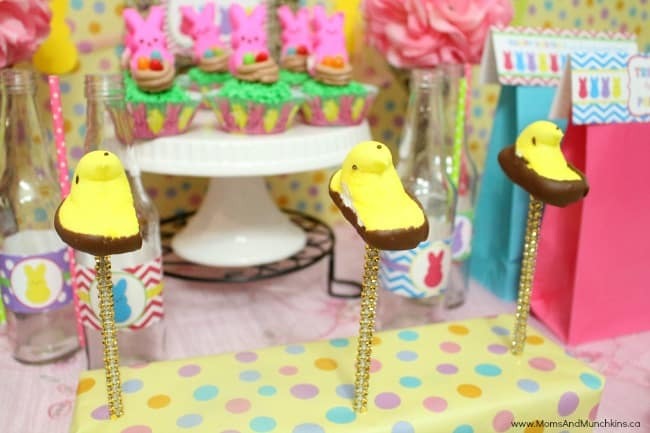 These PEEPS Easter party ideas include decoration tips, food ideas, games and more. 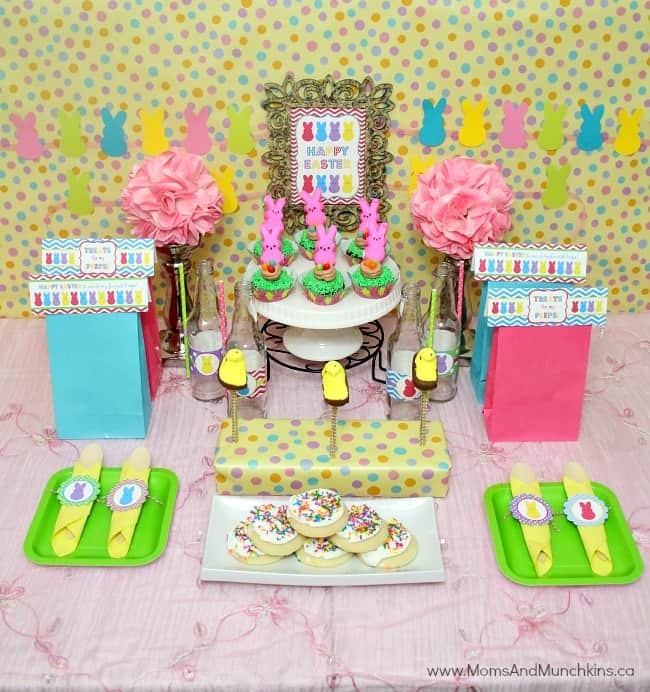 Pastel colors are perfect for a PEEPS party. You can incorporate these through paper lanterns, a wrapping paper backdrop, tablecloths, floral arrangements and more. The printable cupcake circles in this party package can be used on top of cupcakes, as part of a napkin ring, on goody bags and more! 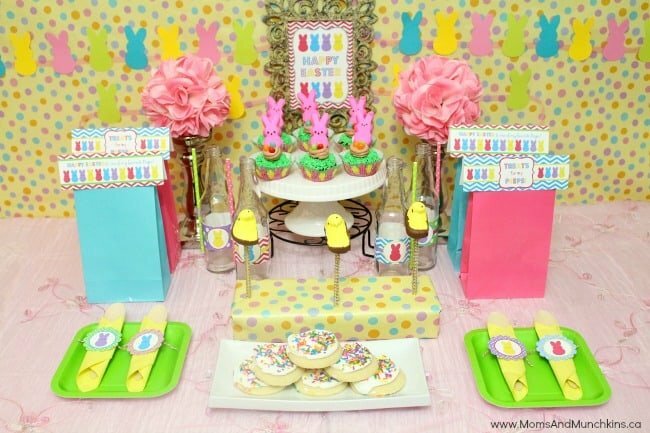 Other Easter decorations that would fit well with this party are a small white picket fence, plastic Easter grass, white pedestal cake stands and this cute sign welcoming guests to the party. Nothing beats marshmallow dipped in chocolate! 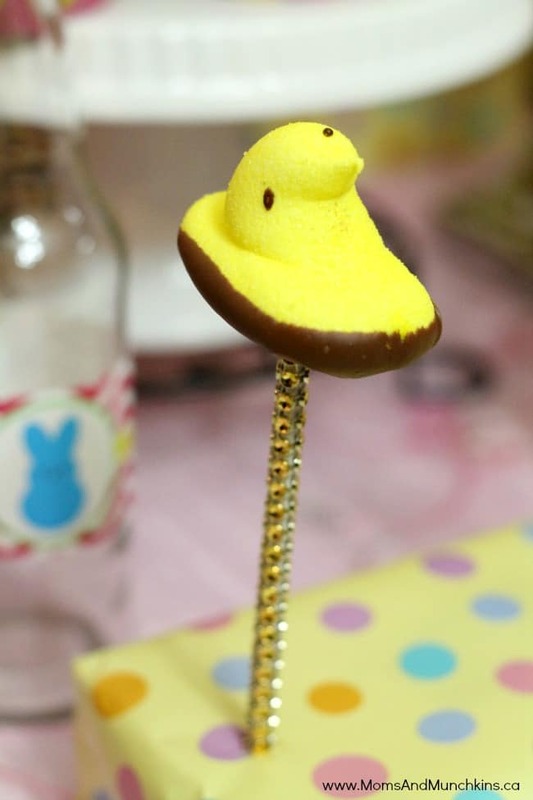 You can easily create cute “PEEP Pops” by dipping the bottom of the PEEPS into chocolate and placing a kabob stick in the bottom. 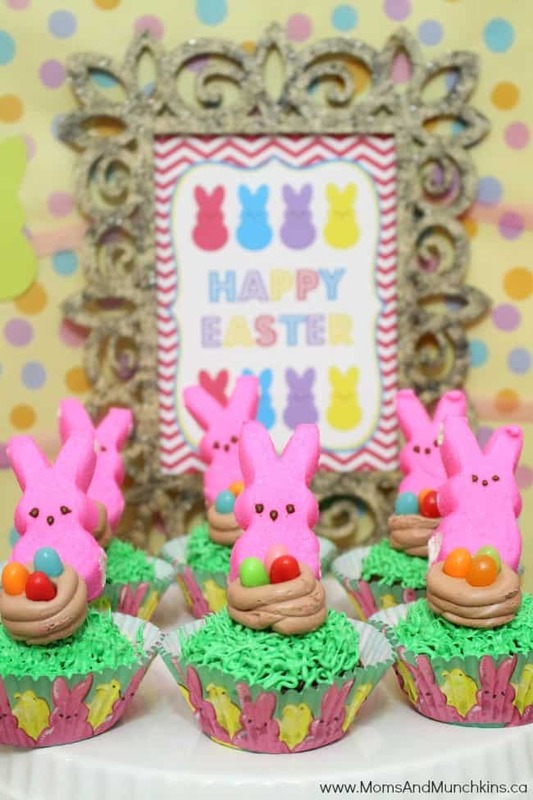 I have the easy step-by-step guide for creating these cute Easter Bunny Cupcakes made with PEEPS. The printable party package also comes with wrappers for mini chocolate bars that can be placed in a bowl on the party table or as a treat in goody bags. These adorable drink labels can be placed on water bottles, pastel colored juice or pop, or plastic drink cups. 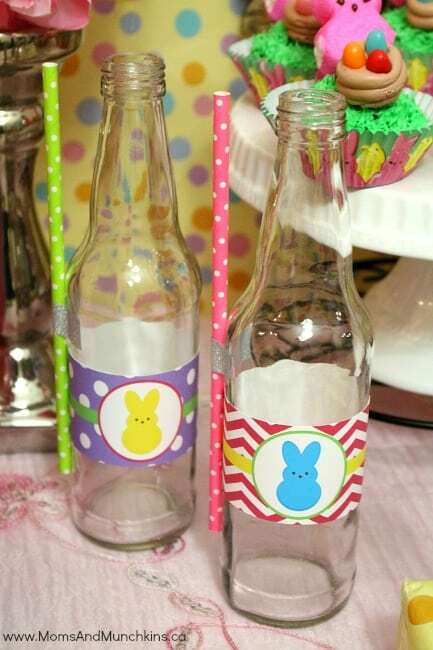 I used silver washi tape to hold bright colored straws on the sides of the bottles. 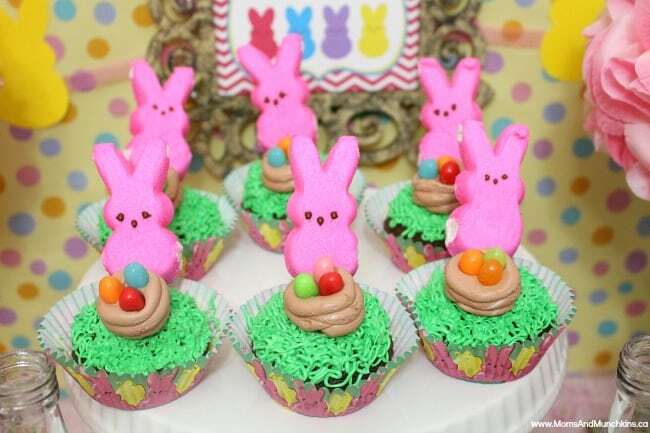 For more Easter PEEP food ideas, you can check out the cute recipes on their website. My favorite are the PEEPSicles! While shopping today I noticed that you can now buy candy, cake and cookie molds that look like PEEPS so you can create your own desserts as well. Don’t miss our collection on PEEPS Dessert Ideas. An Easter party wouldn’t be complete without a fun scavenger hunt! For this Hide & PEEP game, simply hide marshmallow PEEPS wrapped and placed in plastic eggs. 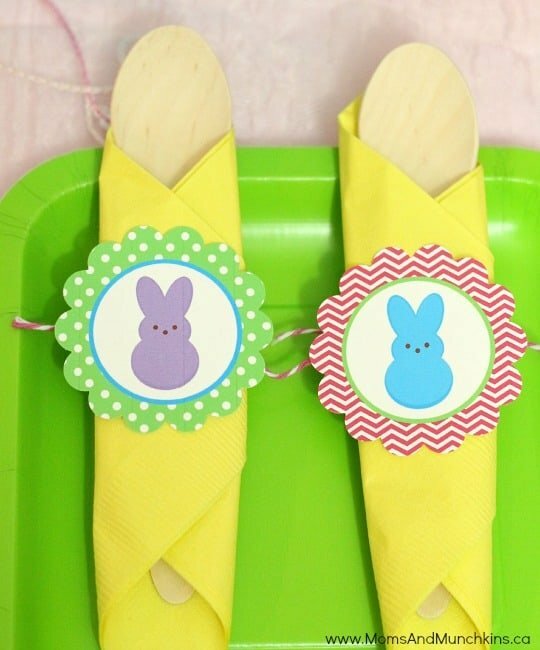 For a fun craft idea, kids can design their own mini Easter basket to store their PEEPS treats. They could start with a plain plastic sand bucket and decorate it with feathers, ribbon, glitter glue and other craft supplies. 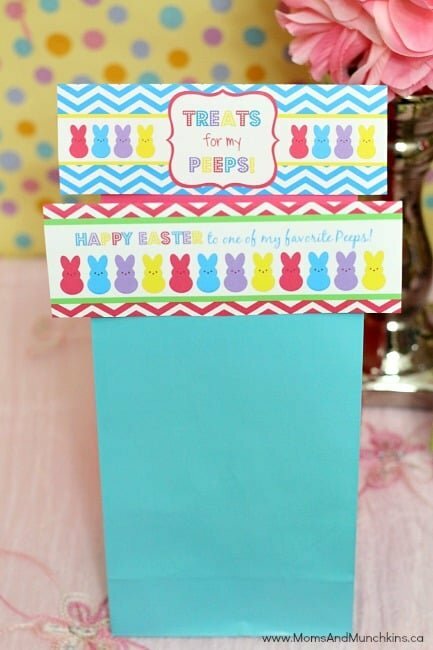 These printable Easter treat bag favor labels can top bags filled with Easter PEEPS, PEEPS S’more kits (graham crackers, PEEPS and a chocolate bar), or fun spring toys like bubbles, sidewalk chalk, etc. For more Easter fun, visit our special Easter Fun page for loads of free printable games, activity ideas, party ideas and more! We’re adding new ideas for holiday fun all the time! Stay updated on the latest ideas by following on Facebook, Twitter, Pinterest and Bloglovin’. *Disclosure: Princess & the Peas provided Moms & Munchkins this printable set free of charge. All opinions expressed here are my own. 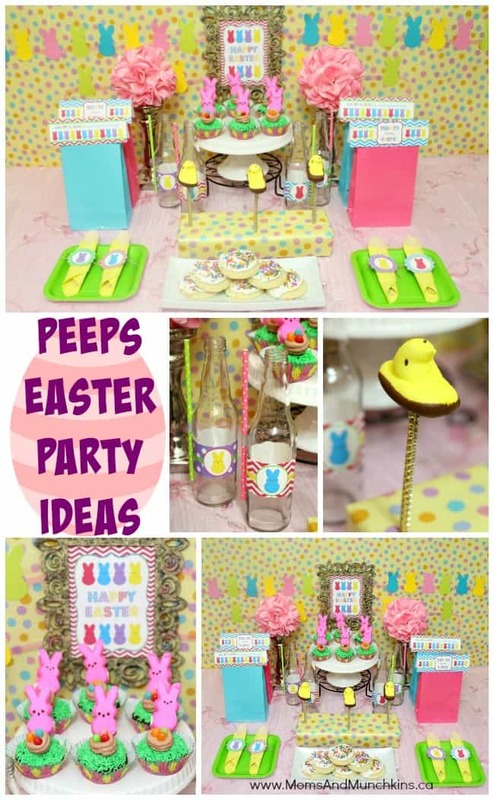 I love Peeps, and these colorful printables would be so great for an Easter party. Thanks for sharing and Happy Easter! These Peeps ideas are so cute!